There are two ways in which a homeowner can notice when Garage Door repair is required. The door is not closing or opening properly or it is making strange scraping sounds. When the system is producing scraping sounds which seem to come from the friction between two metal parts, you need to take timely measures to fix the problem. Otherwise, the risk of injury multiply day by day that the issue is not solved. The scraping sounds typically occur when the door has loosened up in its track. In this case, it touches the edge and the created friction causes the scraping sound. Usually, the problem is due to loosened tracks or to a loosened wheel. The good news is that it is really easy to fix. Your first task is to tighten the Garage Door Track. You need to use an appropriate screwdriver for the bolts on the door, tracks and wheels. Just avoid tightening the track too much as this can cause other kinds of issues. You need to tighten the wheel as well. This is important especially if you cannot determine which of the two parts caused the problem. You will save time and effort and ensure the best chances of successful repair. If the tightening of these Garage Door Parts does not work, then the problem must lie with the spring. It is easy to notice a worn out or improperly functioning spring with basic visual inspection. Its position and alignment may differ from those of its counterparts. If it is worn out, you will see that it is not as elastic as its counterparts and that it cannot compress properly. In any case, the part must be replaced. 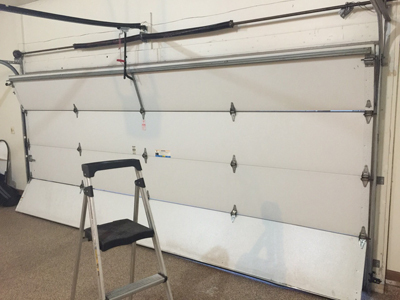 Garage Door Spring Replacement should never be attempted by a person who does not have the appropriate technical skills, knowledge and experience. Otherwise, the risk of accident is extremely high. For fixing a worn our or Broken Garage Door Spring, you can rely on our Garage Door Repair Company in La Palma.